Micro-budget and independent filmmakers had high expectations this year after the excitement of last year's breakthrough NAB, which saw the introduction of the Panasonic GH4, the first interchangeable lens 4K camera below $2000; the Sony A7s, the first full frame camera with UHD output; the AJA Cion, the first 4K Super 35 shoulder mount below $10K; and the bargain priced Blackmagic URSA, the first UHD production camera below $7000 with XLR mic inputs and a standard external battery mount. Canon was the odd man out at NAB 2014, with no major new camera announcements in this category. Their floor display was a live demonstration of the overpriced 4K Canon 1D C, which was already several years old at the time of the show. So, when NAB 2015 rolled around, more breakthroughs were expected from the major camera manufacturers. Would Sony introduce a 4K A7000? Would Canon introduce an interchangeable lens competitor to the GH4 below $10K? Would Panasonic finally give us a successor to the AF100 - with the GH4's features in a camcorder body? 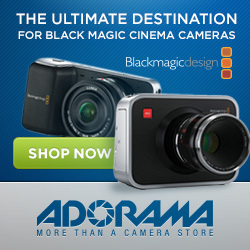 What did Blackmagic have up its sleeve? As the smoke clears from the big press conferences and announcements on Monday, it seems that all of the major manufacturers have chosen to rest on their laurels - except Blackmagic. Sony had nothing to show in this market segment this year - while Canon and Panasonic did have new offerings for micro-budget cinematic shooters, the $2499 XC10 and the "under $5000" AG-DVX200. Surprisingly, however, both of these cameras turned out to have fixed lenses, and "smallish" sensors. A little disappointing in a marketplace that has shifted towards interchangeable lens, large sensor cameras. Panasonic's timing was especially unfortunate. In a series of leaks overnight and early on the morning of the DVX200's rollout - Blackmagic pursued their now-standard NAB strategy. They posted banners with images of their new cameras around the convention center for bloggers to find and post on social media. Images of their major new camera leaked from their pre-announcement party. And they posted images and tech specs for their new camera before Panasonic had a chance to make their announcement (even now, the URSA Mini product page is up, while there is nothing official to be found about Panasonic's AG-DVCX200 outside of a stale press release). By the time Panasonic held its press conference Monday morning, Blackmagic had stolen their thunder with buzz surrounding a camera that both outspec'd the DVX200 and undercut it on price. But it wasn't just a well executed communications plan that won the show for Blackmagic - it was a new camera with features the market has been asking for; an affordable, lightweight Super 35 interchangeable lens camera with good shoulder-mounted ergonomics, built in XLRs with phantom, standard battery mounts and solid 4K codecs (to include losslessly compressed RAW) - all in a rugged body. Weight 2.29 lbs. 6.6 lbs. 5.95 lbs. 6.6 lbs. No, specs aren't everything - it will be important to see images from these cameras in the hands of real shooters - but if the indie market wants a 4K RAW (or 10-bit ProRes), large sensor, interchangeable lens Super 35 camcorder with 160fps HD slow motion and a global shutter that can be either handheld or shoulder mounted without breaking the shooter's back (or bank account), then URSA Mini is pretty much the only game in town. As regular readers know, I've been looking for a replacement for my trusty Panasonic TM900 camcorder for a few years now. I want a large sensor, interchangeable lens camera with camcorder ergonomics plus pro mic inputs and a strong, gradeable codec to pair with my GH3, and later, my GH4. I had almost settled on the $3995 UHD JVC GY-LS300 - but its weak 8-bit h.264 compression was a challenge - and made it difficult to sell my Blackmagic Pocket Cinema Camera, with its robust, gradeable 10-bit ProRes and CinemaDNG RAW. URSA Mini solves this problem. I can now sell the TM900, the Pocket Camera, the GH1, GH2, GH3 and all of my MFT glass - then buy an URSA Mini EF (plus a $599 Metabones EF to MFT Speed Booster for the GH4) and skinny down to two cameras and one lens system. So, for offering lightweight Super 35 cameras that shooters can afford - and for solving my personal camcorder dilemma - the Blackmagic URSA Mini wins HCR's first annual "Best of Show" award for NAB 2015. Working on the awards banquet - perhaps at NAB 2016.